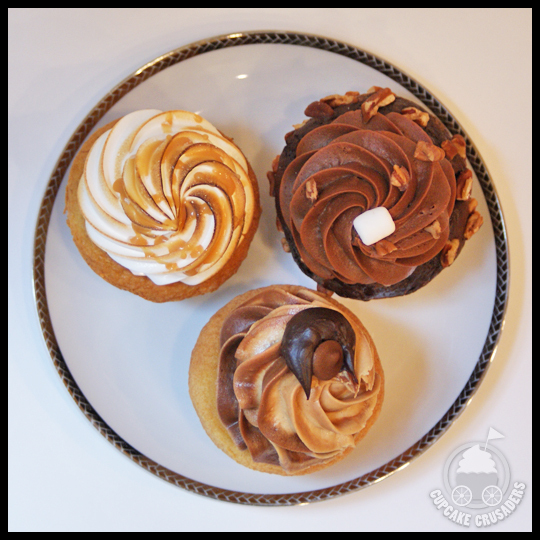 Tag Archives: Kupcakes & Co.
Kupcakes & Co. New Summer Flavors & More! 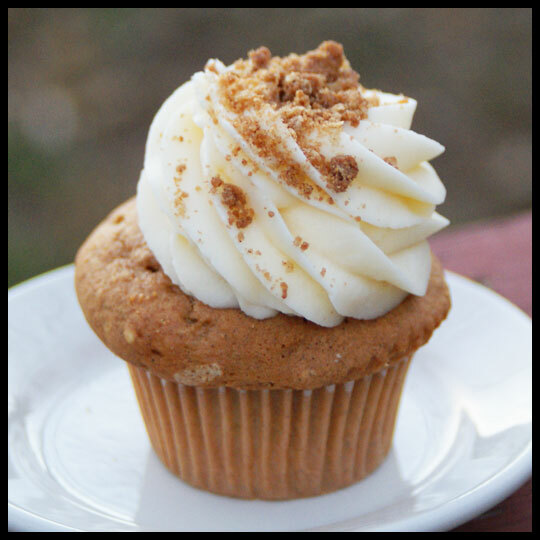 Kupcakes & Co. (Elkridge, MD) is always experimenting and adding new things to their menu, especially seasonal and holiday flavors. While we missed their special Father’s Day flavors, like Jake & Coke and Old Bay & Sam Adams, we made sure to check out the summer flavors that are new this year. Specifically, the Strawberry Lime-a-Rita and Peach Margarita. Both of these contain a tiny bit of booze, so they are for the grown-ups, but we like it that way. Cocktail cupcakes with the right touch of liquor are so much more authentic! This cupcake features a strawberry cake brushed with tequila and topped with a keylime tequila buttercream. I love the added touch of the cupcake being rolled in sugar. We’ve tried Kupcakes & Co.’s strawberry cake and we’ve also had their key lime frosting (which has always been one of my favorites), but the two together, with the addition of tequila was new and I have to say, it’s a winner. Since everything about this cupcake was new to me, it was the one I was most excited about. The cake has fresh peaches and is brushed with tequila, then topped with peach buttercream. I would have liked more tequila flavor coming through, but the fresh ingredients and moist cake still made this cupcake great. 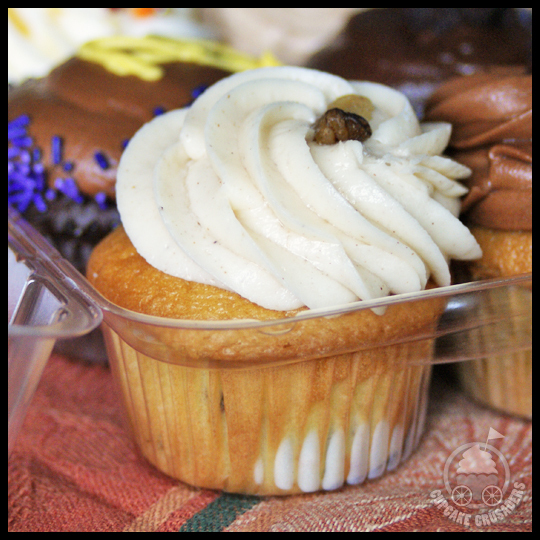 The Piña Colada cupcake is considered a new summer flavor, however you may remember that we have seen this one before. 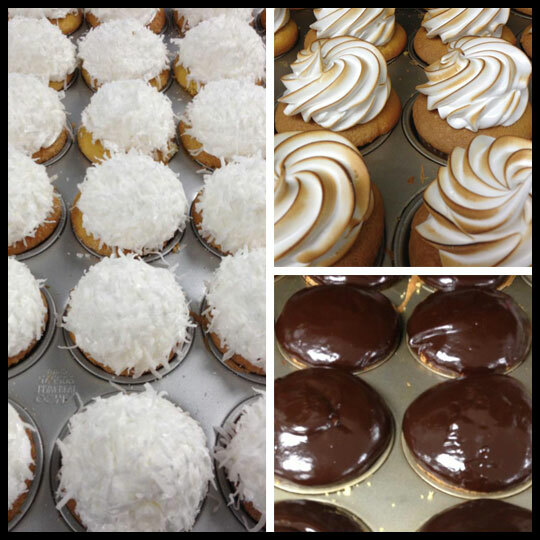 Kupcakes & Co. ran a special “Happy Hour Cucpakes” back in 2012 and Piña Colada was on the menu. But we are happy to see it back for a little longer! 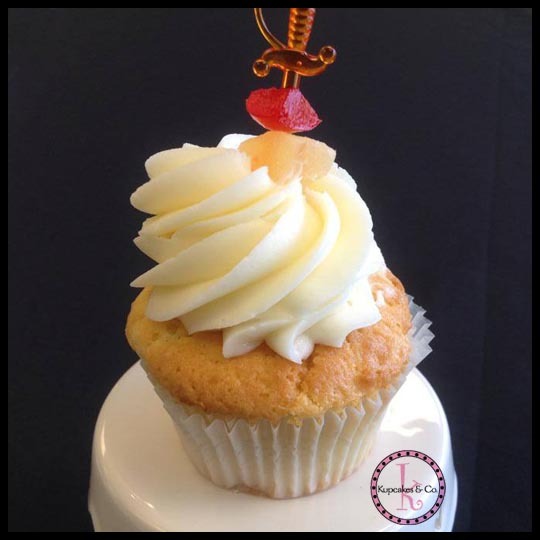 This cupcake is filled with coconut and topped with piña colada icing, with an added piece of pineapple and cherry on top. My daughter saw this cupcake and it immediately became the “pirate cupcake” that she had to have. Luckily this summer flavor does NOT contain any rum or other liquor, so it can be enjoyed by the little ones. And it was. My daughter even ate the cake, which is a big deal! Normally I’m left with the remnants of a frosting-less cupcake. 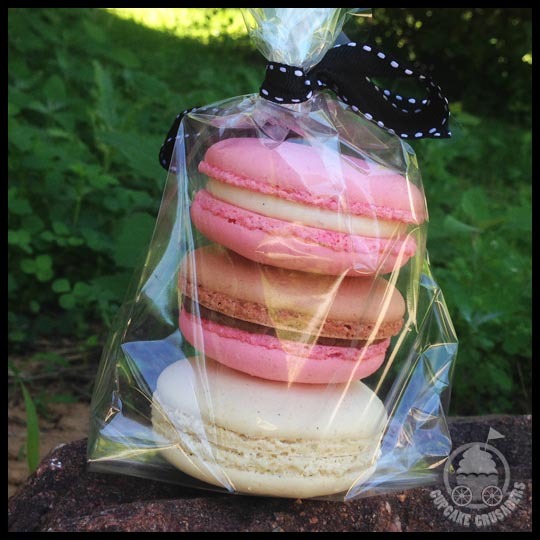 With the full-time addition of Amanda Kupiec, who perfected her French Macaron recipes while attending the Culinary Institute of American (New York), Kupcakes & Co. is now offering macarons throughout the week. You can follow their Facebook page to see what innovative flavors they have. The macarons are the perfect consistency, with a thin crunchy shell and soft and gooey center, filled with a complementing cream. They go fast and take time to replenish, so I recommend calling ahead of time if you have your heart set on grabbing some. 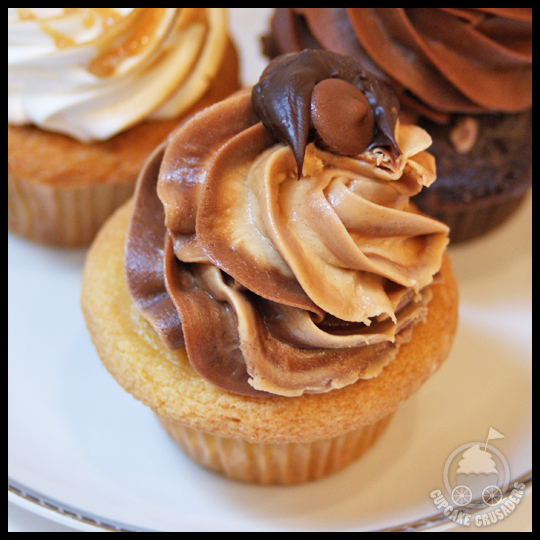 Do you have a favorite summer flavor that you’d like to try as a cupcake? Let us know! New Packaging & Fall Cupcakes From Kupcakes & Co.
As always, Kupcakes & Co. (Elkridge, MD) has new things happening, one of which is a change in packaging. 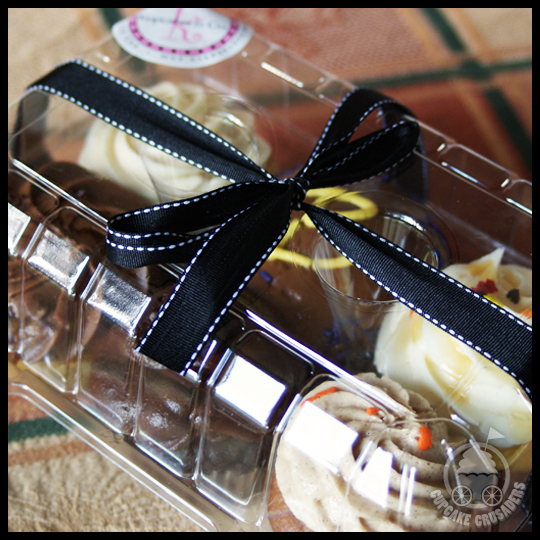 In early September they announced they’d be shifting from their beautiful, black pastry boxes to the plastic cupcake containers, but that didn’t stop them from dressing the boxes up in true Kupcakes & Co. fashion. Tied with a black ribbon, the packaging still looks like a gift you can’t wait to open. 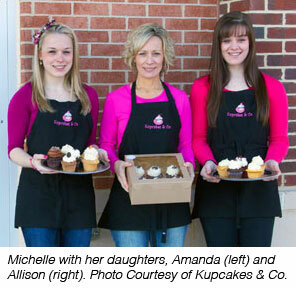 Kupcakes & Co. made the decision to change with their customers in mind. Rising costs of their previous pastry boxes would have raised the price of their product, and they didn’t want that to happen. Although many of us avoid plastic in striving to be more “green,” the Crusaders have some ideas on how to be more environmentally conscious in light of plastic cupcake containers. One of the things we do is reuse the containers. Unlike the cardboard boxes, which almost always end up with food stains and have to be thrown out, these containers can easily be rinsed in hot water and used again. 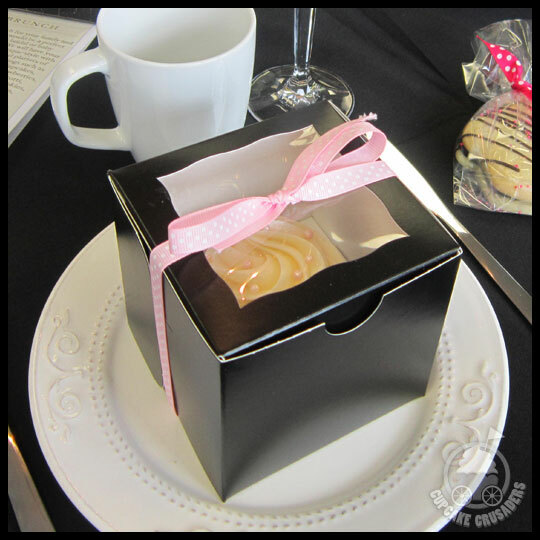 Some other perks to the new boxes are that they travel better (great for the Crusaders, since we are always sharing) and they keep the cupcakes fresher (pastry boxes pull moisture from the cupcakes). When I heard about this flavor, I couldn’t wait. The combination piqued my interest from the start. My husband was lucky that I waited until he came home to share it. The aroma when pulling it out of the box was pure, sweet pear. On my first bite I got a generous amount of fresh baked pear, a crunch from nuts in the cake, and a hint of spice. This cupcake is, by far, the most unique “fall” flavor I’ve had (and one of the most successful creative flavors I’ve tried in a long time). Kupcakes & Co. topped their Ginger Pear cake with cinnamon cream cheese frosting, a perfect match. Together this cupcake was not too sweet and well-balanced. Crusader Stacy requested the Pumpkin cupcake, which I’ve had before, but this was her first time. She said that it was, “So good. I love pumpkin everything and this cupcake screamed fall. 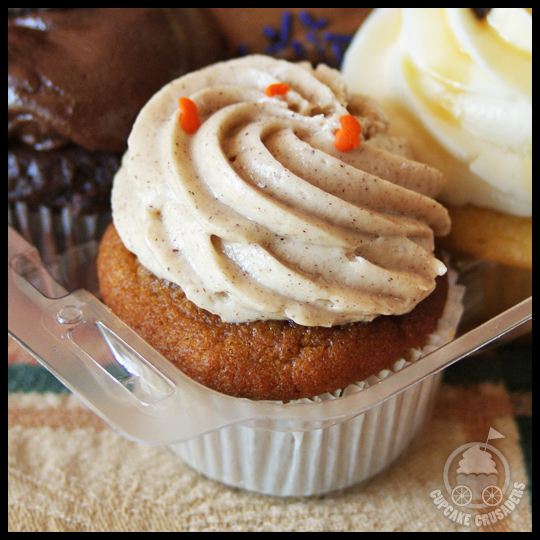 The cake was dense, like on most pumpkin cupcakes, but still really moist for two days later.” We can thank the moistness on the new container! Another new endeavor for Kupcakes & Co. has been brownies. We’ve mentioned before that the owner, Michelle’s, daughter is a student at CIA in NYC. After a summer of internships and helping out in the Kupcakes’ kitchen, Amanda shared a recipe that has been getting rave reviews (one of her mega-brownie creations was even featured in Howard Magazine). I was lucky to grab the LAST Maple Brownie cupcake (at 11am!). 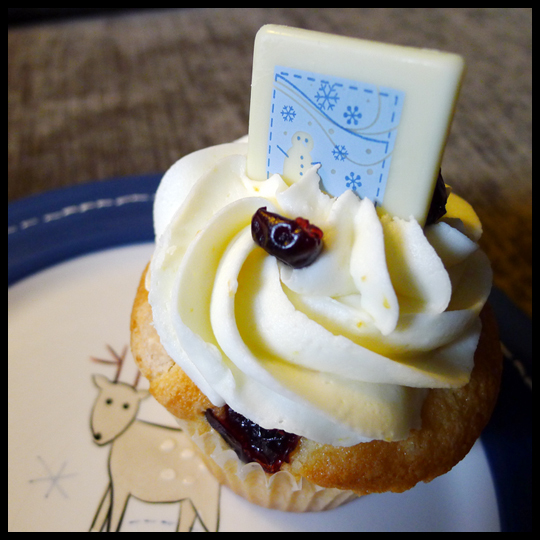 It was a great brownie topped with an amazing maple frosting, dressed up as our favorite…a cupcake! Okay, so it’s not a cupcake…and it’s large, more than enough for two people. But, this brownie has to be shared. My exact thoughts were, “I mean, seriously? 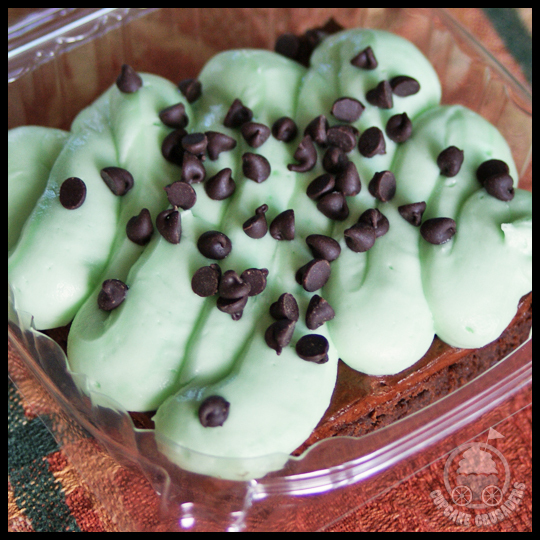 Holy moly.” The brownie was rich and moist, with a lot of depth to the chocolate flavor, topped with a thin layer of chocolate buttercream, and then smothered in a heavenly mint chocolate frosting. You’d think that the brownie might get lost under all that frosting, but each holds its own. Together it was decadent, but not too sweet, and refreshing. The frosting was so light in texture that it was like biting into a cloud (if that was possible). Kupcakes & Co.’s “Boutique” flavors floor me every time. This cupcake tasted JUST like brownie batter! How is it even possible for a baked product to taste like batter? I just don’t know. I’ve said this about the Cookie Dough cupcake, but it’s like magic. The cake was baked with a fudge “batter” center and high quality dark chocolate chips. That all sunk to the bottom, but still added to the layer upon layer of chocolate flavor. If you are a chocolate lover (or brownie batter lover), you need to try this. Some other new flavors hitting the Kupcakes & Co. menu are The Twist (a vanilla and chocolate combination cupcake topped with a Hershey Kiss), White Chocolate Espresso, and Beer & Pretzels (for Oktoberfest). I see another visit happening soon. Which flavor should we try for you? Minnie Mouse & Lemonade Make a 2 Year Old Happy! 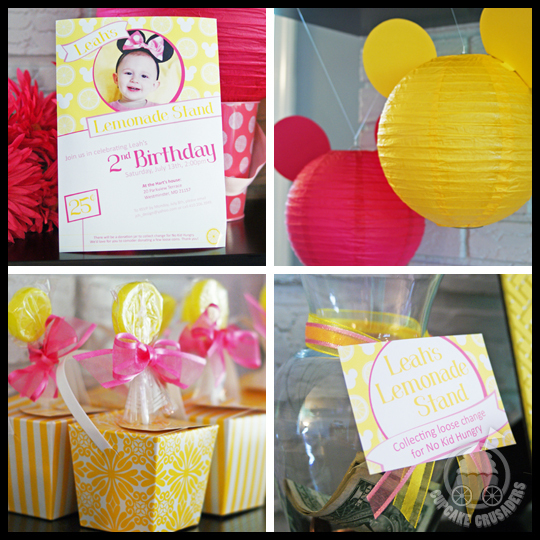 My ideas for a lemonade stand themed party began brewing shortly after Leah’s 1st birthday last year (I couldn’t keep myself from thinking about it!). 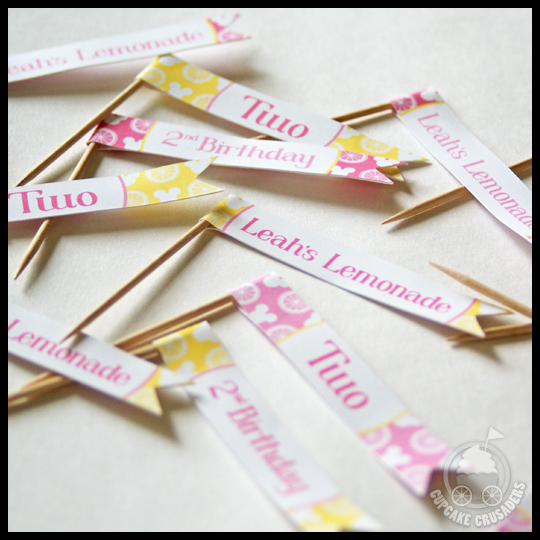 I love the color yellow and the idea of lemonade for a summer party with all the lemon-themed treats and cupcakes we could have. As the year progressed and Leah developed a love for all things Mickey and Minnie, I thought it would be cute to include touches of her favorite characters. I knew yellow would be a dominate color, but after adding Minnie into the mix, I also included pink…which worked well for pink lemonade too. 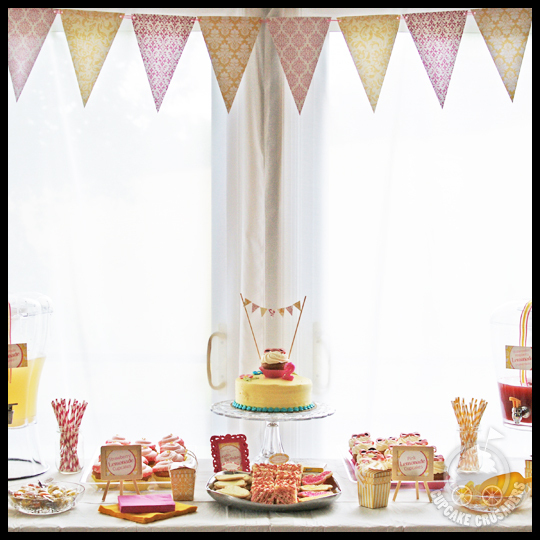 Some of the DIY items included the invitation and party signs, Minnie/Micky paper lanterns, bunting, and party favors for the girls. We also collected “change” for No Kid Hungry, which totaled $54 at the end of the day! Some of the items I decided not to do myself this year were the cake and cupcakes. 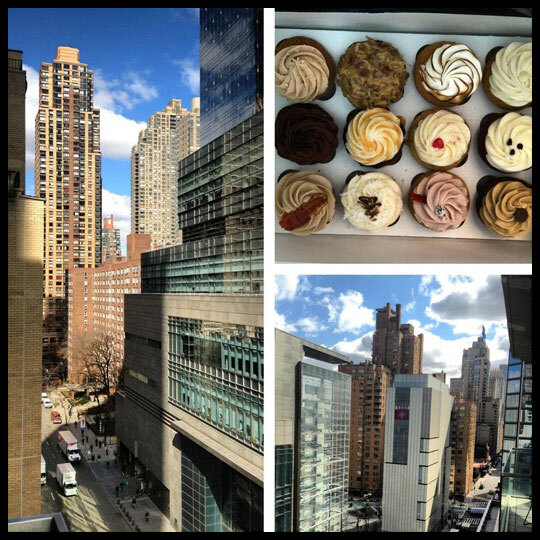 I splurged on cupcakes, deciding to allow the experts to do their thing. Since I splurged on the cupcakes, I kept the cake inexpensive by purchasing an $8 cake from BJs Wholesale, which was the perfect color right off the shelf. 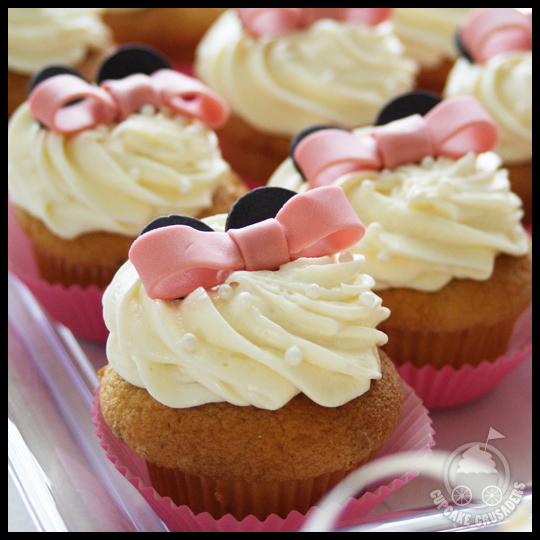 Kupcakes & Co. has created Minnie Mouse cupcakes for clients in the past, so I knew their capabilities to make them look good. I used one on top of the cake, to jazz it up, along with a glittery candle and cake bunting that matched the window bunting. 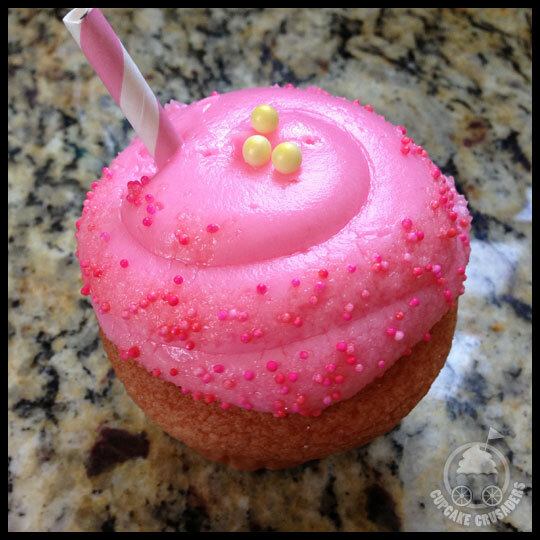 They also began offering Pink Lemonade cupcakes earlier this year. It’s a sweet cupcake, but kids like sweet (and some adults, like my husband). With those facts in mind, I was swayed to let someone else take this task off my plate. 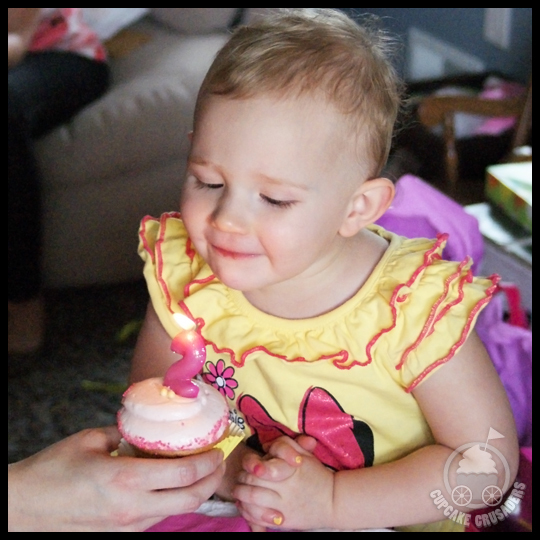 The cupcakes decorated like Minnie Mouse were a special flavor, made just for Leah! Well, sort of. Their Strawberry Lemon cupcake is lemon cake with strawberry frosting, but I love their strawberry cake and lemon frosting (the reverse), which I’ve tried from other cupcakes, so I asked if they could put those together for us instead of the usual, and they did! The flavor combination differed from their standard and everyone really liked it. The lemon frosting isn’t too sweet and the cake is light. It was the perfect summer cupcake. 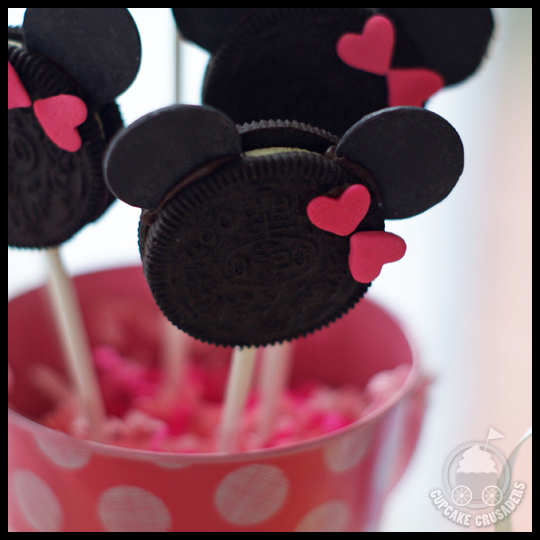 In addition to sugar cookies (some with a lemon glaze), rice krispie treats, and candy, we also had Minnie Mouse Oreo Pops for dessert. This gave our guests another fun, non-lemon flavored, personal-sized treat to enjoy (they were fairly easy to make, after a test run earlier in the week—let us know if you want to see more about how to create these pops). One thing we forgot to pull out were the cupcake flags. A few of the Pink Lemonade cupcakes would have been cute with some little flags in them, but the table didn’t really need the extra decoration in the end. Leah loved all the Minnie Mouse touches, the candy that was within reaching distance, and of course the cupcakes (or at least the frosting). It was a great day, filled with love from family and friends that came to celebrate my little girl! If you’d like to see more from the party, you can check it out on Catch My Party, where we were featured again on their homepage, and Fizzy Party, where we more about the party details.! Also, the party designs (without Minnie Mouse – just lemonade themed) will be available on our new Etsy Shop, Eye2Eye Design, so keep an eye out for that! 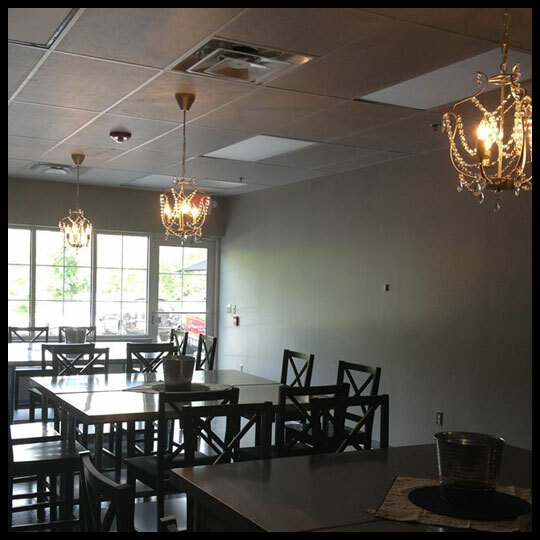 Just a little over a week ago, we mentioned that Kupcakes & Co. (Elkridge, MD) would be debuting their new Boutique Celebration Room during a Grand Re-Opening. This past Saturday, the Crusaders were there to show our support, sample some new items, and get the full scoop on what the new space looks like and has to offer. 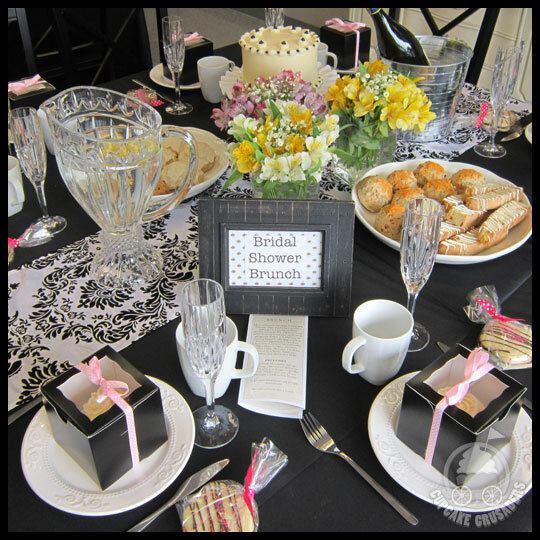 The Bridal Shower table showcased the brunch offerings, which included cupcakes and cookies, ready to eat or take as party favors. Champagne or wine can be brought in by the host to add to the celebration! 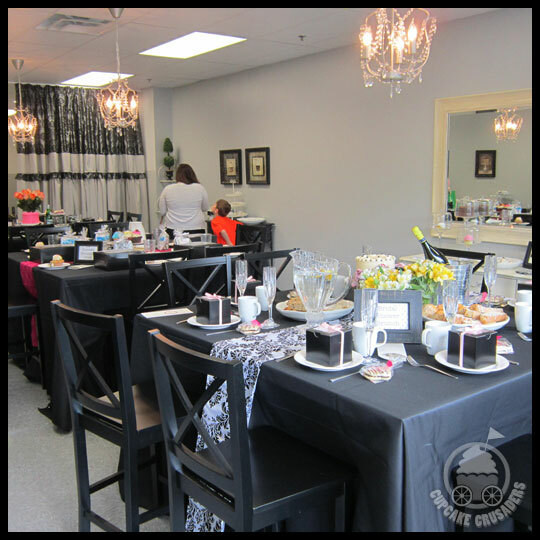 The brunch package would also be great for a baby shower, tea party, or small family reunion. I think most of us can agree that an afternoon of eating and learning how to professionally decorate cupcakes sounds like a lot of fun. I was surprised to see that the guests don’t just decorate one cupcake each, but are given six! 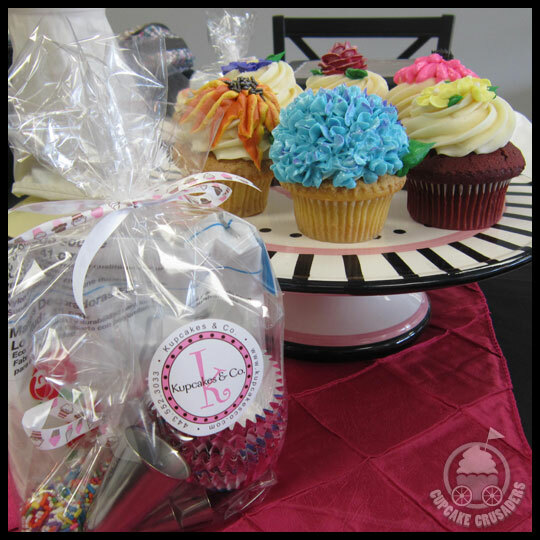 Kupcakes & Co. even provides a cupcake for nibbling on while you decorate, that way you aren’t too tempted to dig into your creations before showing them off to your friends and family. 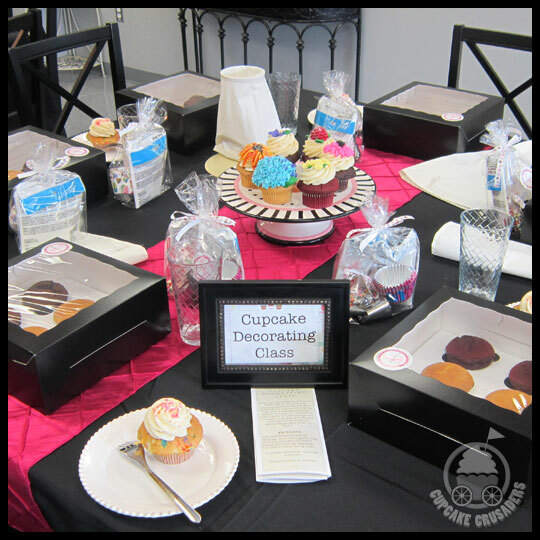 When you book the Boutique Celebration Room for a decorating class, you not only take home six cupcakes, but also a goodie-bag filled with tools and decorations so you can continue to practice embellishing your own cupcakes at home. 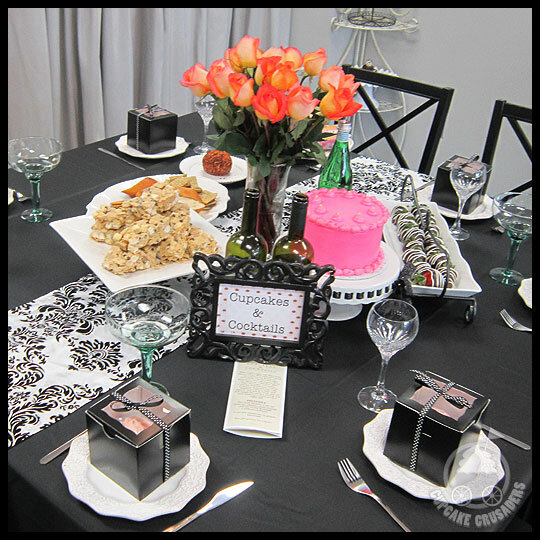 Cupcakes & Cocktails…the ultimate girls’ night! You bring the booze, and Kupcakes & Co. will provide everything else. 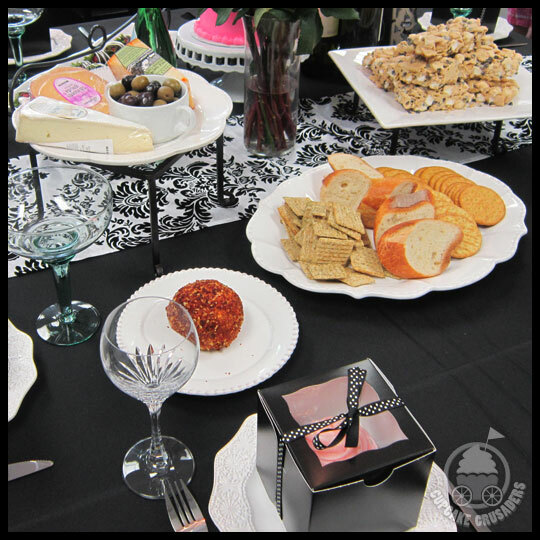 In addition to fabulous sweet treats, Kupcakes & Co. will also provide a selection of cheese, crackers, olives, bread, and mixers to pair with your drinks. I asked if they had any plans in the works for hosting their own Cupcakes & Cocktails night and it sounds like it is a possibility, so we’ll be sure to share any information we get on future events. The Grand Re-Opening was also the perfect platform to debut a couple of new items. We Crusaders sampled EVERYTHING that was offered (would you expect any less from us? ), some of which is tried and true, and some of which was new to us, like the Cinna-bon-bons. They were amazing. But the (non-cupcake) stand out for me was the new Bliss Bar. 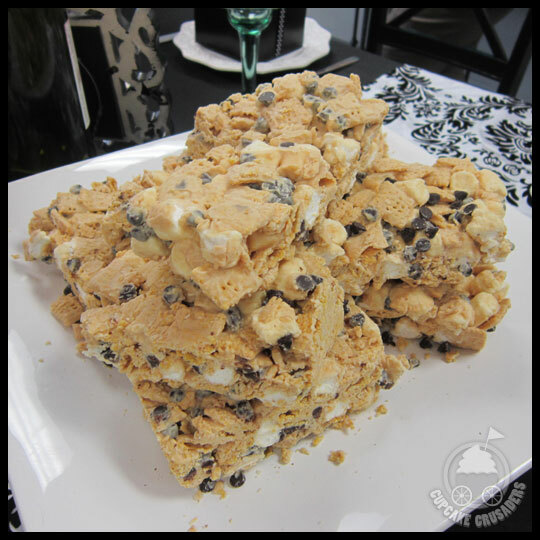 Appropriately named, the Bliss Bar is a cereal bar, with marshmallow, chocolate chips, peanut butter, and white chocolate. It’s light in texture and yet still rich in flavor. The Pink Lemonade cupcake also made its debut. I’m very excited about this cupcake for a couple of reasons. One, it is perfect for summer! 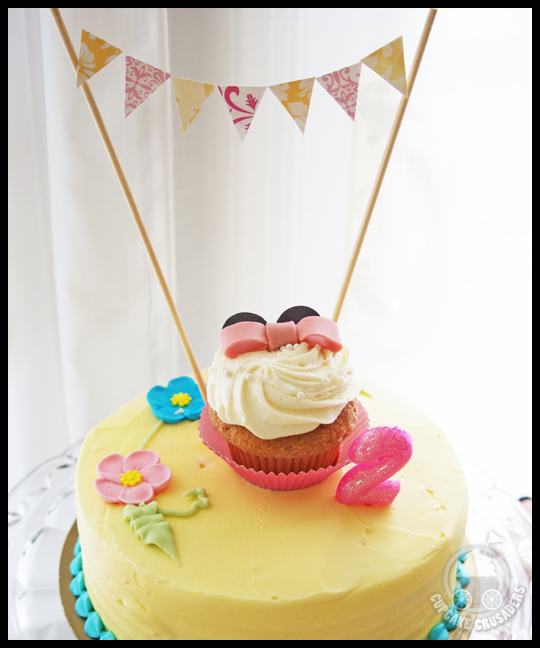 And two, it will be making an appearance at my daughter’s second birthday party (there will also be a new combination, never before done by Kupcakes & Co., so you’ll have to look out for more to come on that next month!). 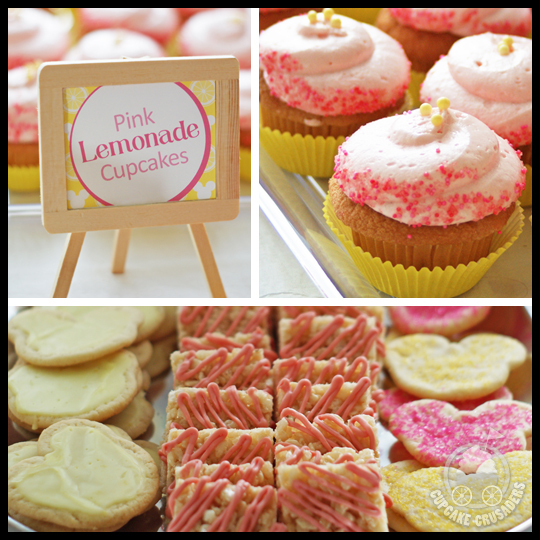 The Pink Lemonade cupcake is a lemon cake with extra zest and topped with a pink lemonade frosting, then sprinkled with lemonade crystals. It definitely has a different “zing” that a lemon cupcake. I only had a bite, but Stacy was able to elaborate, saying that the frosting was very sweet and tart. Maybe too sweet for her, because she couldn’t eat it all. However, the cake was perfectly pink and citrus-y. We both loved the simple, festive, and cute decorations. 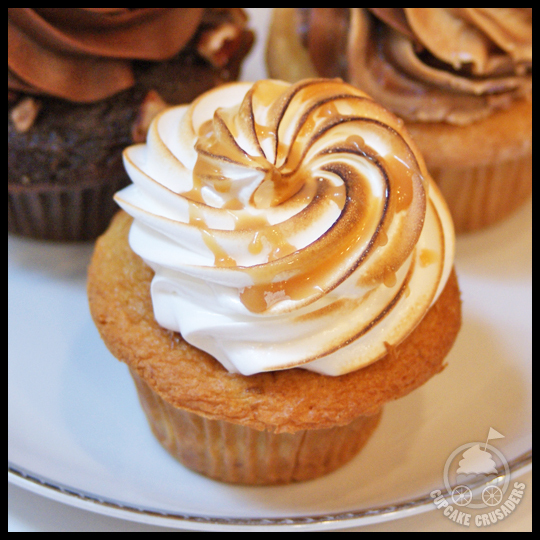 Earlier in the month, Kupcakes & Co. also added their summer seasonal cupcakes back on the menu. 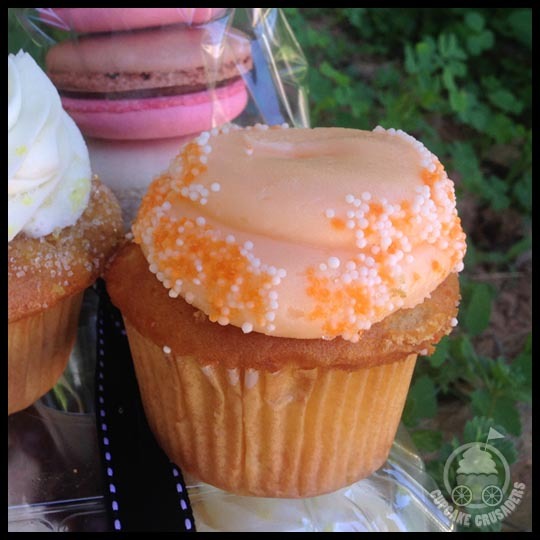 There was one we hadn’t tried, the Orange Creamsicle, so Crusader Stacy added it to her cupcake collection (she had also purchased the Pink Lemonade above, Peach Cobbler, and Key Lime). 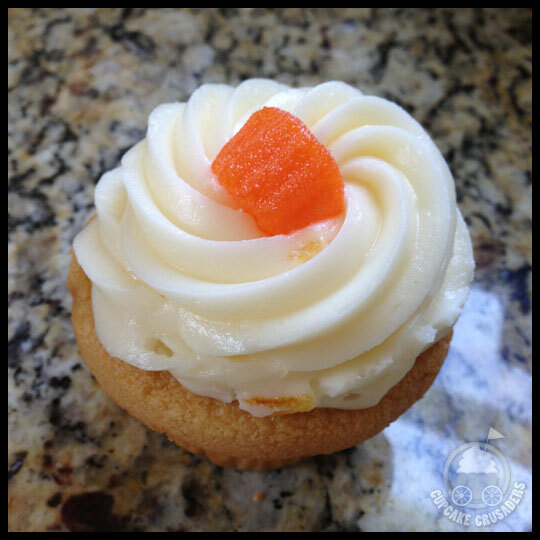 Stacy really liked this cupcake and said it was, “much more subtle than the Pink Lemonade cupcake, with a nice orange flavor.” She added that the, “cream flavor balanced it really well.” Sounds like one that I need to try this summer! 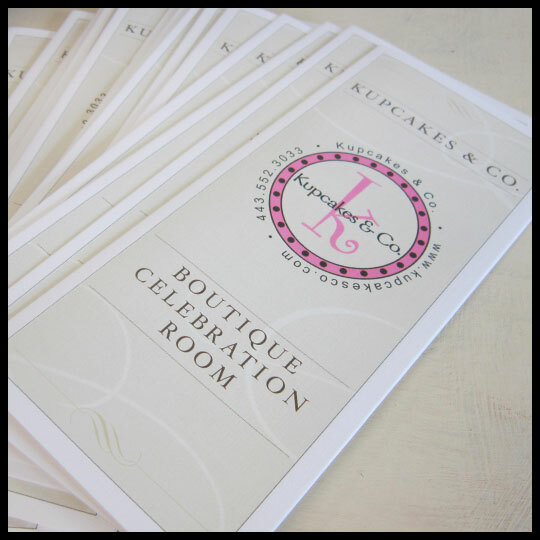 If you’d like more information about the Boutique Celebration Room, you can visit Kupcakes & Co.’s website or Facebook page. They have more photos on their Facebook page, so you can see additional details of the beautiful decor. I’d love to host a tea party for my friends in the new space, with cheddar chive biscuits, scones, and biscotti. The tough decision would be: Which cupcake to serve?! 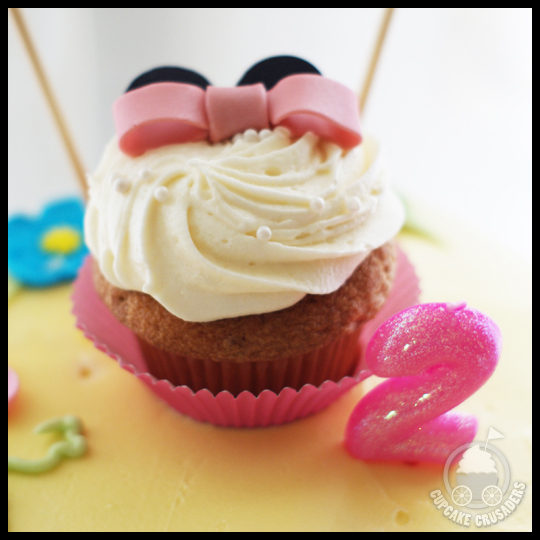 If you could throw a party at a cupcake bakery, what type of party would you like to have? 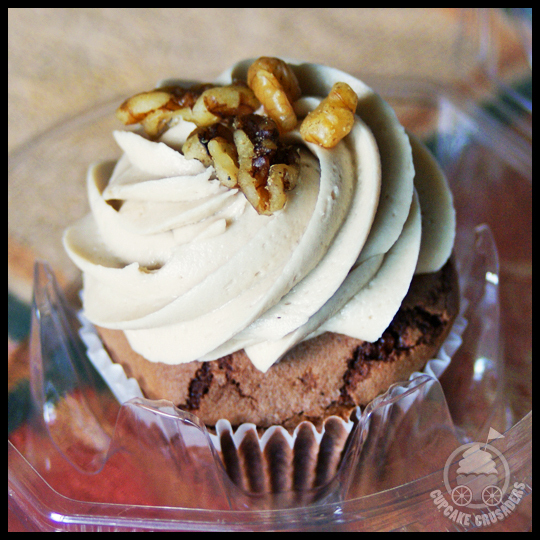 We visit and review Kupcakes & Co. a lot and one of the reasons is because they are always doing new things, adding new flavors, and increasing their offerings of baked goods. For example, their cheddr chive biscuits aret a brilliant idea! I recently stopped in to grab one as I was passing by in the morning because hadn’t eaten breakfast yet. They open early and have been offering coffee and homemade biscotti for some time, but (tough as it may be) I might not have stopped in on this particular morning if I wasn’t able get something savory (because I was already on my way to pick up a dozen cupcakes…shocking, I know). Kupcakes & Co. is what I would have already described as the best in a boutique cupcake experience. We’ve shown you pictures of their cute storefront, talked about how wonderful the customer service is, and shown you many photos of their beautiful cupcakes. And now they are taking it to the next level…They are opening a Boutique Celebration room, and I got the scoop and a sneak peek! The new space, adjacent to their storefront, will be available for parties of up to 24-30 guests. For now, they will focusing on adult events, such as bridal showers, but I suspect it will only be a matter of time before they host a cupcake party for a lucky little girl. The Boutique Celebration room will be unveiled during a Grand Re-Opening event, on Saturday, June 8th from 10am-3pm. The party room will be fully decorated with all of the trimmings you’d expect (The owner, Michelle, also revealed to me that they have plans for a custom mural to be painted by a local artist). Of course you can’t have a Grand Re-Opening without cupcakes, so Kupcakes & Co. will be serving up free samples, new dessert items and will also have prizes and giveaways. The Crusaders will definitely be stopping by! 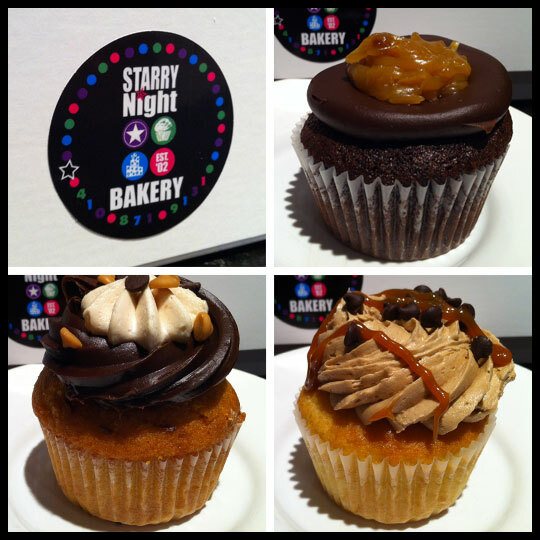 Some of the treats you might be able to sample are their new line of Boutique Cupcakes. We’ve been trying to review all of their Boutique Cupcakes, because they bring the ultimate in cupcake indulgence and are only offered for a limited time. We missed the last round, which was a pie theme (Key Lime, Coconut Cream, and Boston Cream), but couldn’t miss the latest: Banana’s Foster, Rocky Road, and Moose Tracks. I was expecting the Banana’s Foster cupcake to be my least favorite of the three, based strictly on appearance, but I should have known better. You can’t judge a book (or cupcake) by its cover, right? While it’s still a pretty cupcake, it didn’t seem to have the thrills (i.e. toppings) that the others had. Man, was I wrong! The banana cake was so moist and full of flavor, and the homemade caramel filling took the level of moistness up even higher. Paired with a light meringue frosting (love! ), this cupcake had the perfect amount of sweetness. Rocky Road is hands down, my favorite ice cream flavor. While I was really excited about this cupcake, all in all it was my least favorite of the three because it was the most “expected.” The signature fluffy, moist chocolate cake was baked with walnuts and filled with marshmallow cream that oozed into the cake. That part was really amazing. The cupcake was then piled high with chocolate buttercream. I had to pull out a fork to eat this cupcake. 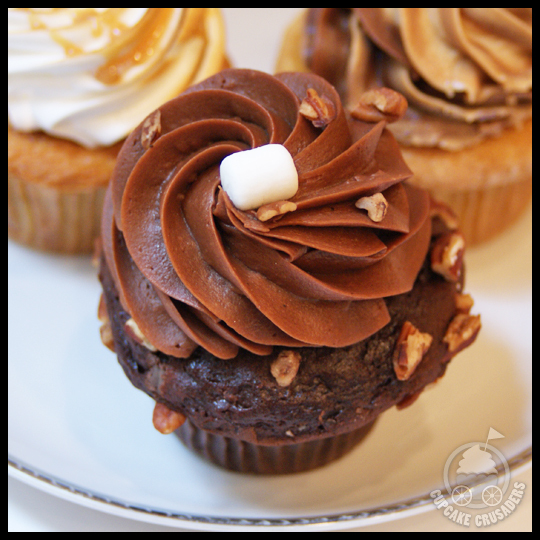 If you love milk chocolate frosting, then this cupcake is made for you. It’s very rich, so keep a glass of milk nearby! This Dark Chocolate Ganache cupcake is on Kupcakes & Co. regular rotating menu, but they like to dress it up for special occasions. This particular one was for Preakness, but you can also see these pretty flowers on their Mother’s Day cupcakes and more. I had never tried the Dark Chocolate Ganache cupcake before, but being a big fan of dark chocolate, I’ve had my eye on it. As simple as it may have seemed (underneath the flower and sprinkles), especially compared to the Boutique Cupcakes, it wasn’t simple at all. The ganache was rich and cocoa-y without the extra sweetness of milk chocolate buttercream. And the chocolate cake, always moist and light, is perfect on its own. If you haven’t had a chance to check out Kupcakes & Co. yet, their Grand Re-Opening would be the perfect opportunity. Check out their website or Facebook page for more info, and maybe I’ll see you there! From Baking Memories to Cupcakes for Gayle King: Q&A with Michelle Kupiec, Owner of Kupcakes & Co. 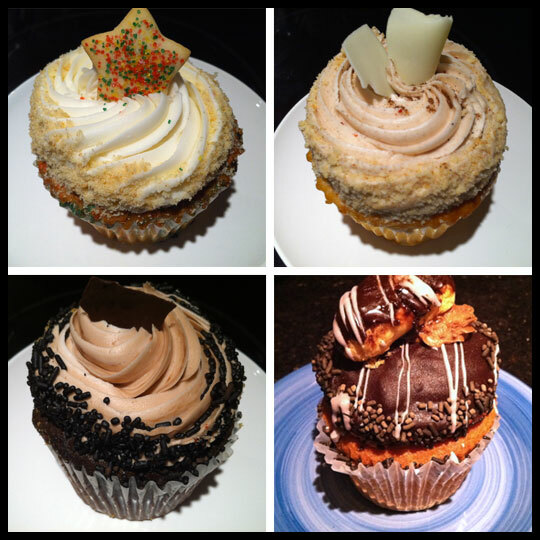 If you follow us, you already know that Kupcakes & Co. (Elkridge, MD) is one of our favorite cupcake spots. 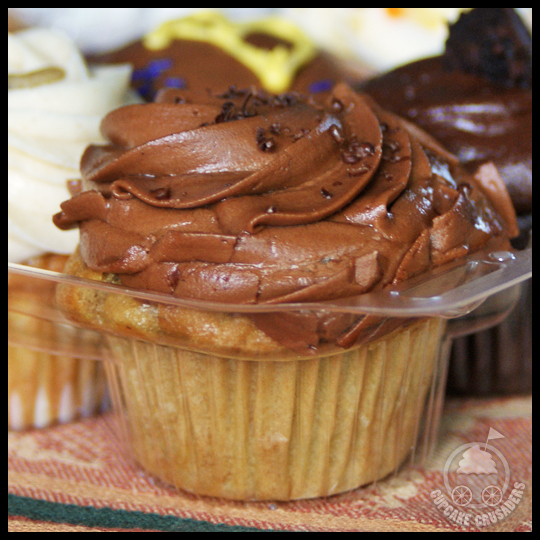 Not only do they produce a consistently delicious cupcake, the employees are friendly and helpful, the selection is beyond amazing, they are always looking for ways to expand their offerings and improve, and they take every opportunity to give back to the community. Our first visit was back in the winter of 2011, during their Cupcakes with Santa event, and it was love at first sight. During our frequent visits since then, we’ve gotten to know the “family” including Michelle, whose hands on approach, kindness, and enthusiasm is no doubt one of the reasons that we are always greeted with a smile from the Kupcakes’ team. We wanted to get to know Michelle a little better, so she agreed to answer some of our questions. We hope you enjoy getting to know her and Kupcakes & Co. better too! You are very involved in organizing fundraising events throughout the year. What are some the organizations you support and why do you think it is important give back to the community? We support the Blossoms of Hope Foundation of Howard County. This is a foundation that helps women who are struggling and coping with breast cancer. 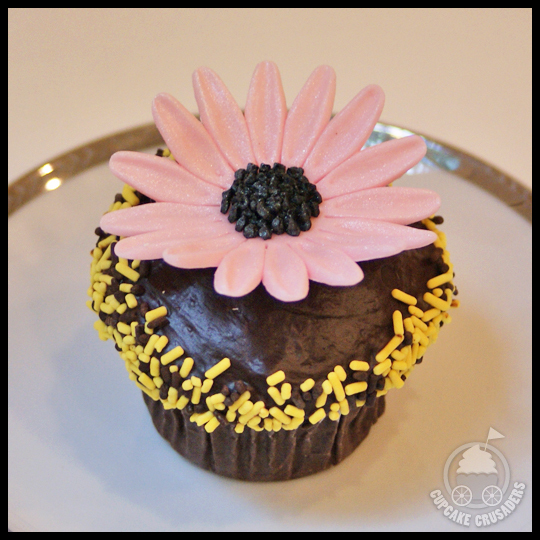 We have created a special, Blossoms of Hope cupcake that we give back 50% of the sales to during Breast Cancer Awareness month in October. We also help out at their Pretty in Pink event in April as well. Another foundation we support is Team Fight, The Ulman Cancer fund for young adults. We have created a Team Fight cupcake that we bake for them for their Blue Jeans Ball and give back a portion of the proceeds to that as well. We also have a huge fundraiser called Kupcakes with Santa when we donate 100% of the profits back to the Howard County General Hospital, where one of my twin daughters spent 5 years. Our weekly donations of cupcakes go to the Route 1 Homeless Shelter, The Grassroots Crisis Intervention Center and the Love Mission of Howard County. These people would never have the opportunity to try our cupcakes, so it feels wonderful being able to give them some of our sweet treats each and every week! We feel it is so important to give back to our community and help those in need. There is always going to be a time in our lives that we need the support from others and at Kupcakes & Co. giving back is a huge part of what we are all about. On your website, you talk about baking with your mother while growing up. What is one of your favorite baking memories with her? My mom is my inspiration, my hero, my best friend! She and I always had so much fun baking in the kitchen together. My most memorable experiences with her are baking our famous pound cake. It was super delicious, from scratch and we always had fun, laughing and carrying on in the kitchen! We used to say that no matter what, if we were in the kitchen together, we could get through anything! She also used to let me experiment with ingredients all of the time and never minded if some of my creations turned out a little crazy! She was super supportive of me then and continues to be everyday! You also mention that you began baking with your daughters from an early age. What were some of the first things you taught them in the kitchen, and can you offer any tips for other parents who’d like to start baking with their children? What is your favorite tool in the kitchen? My favorite tool is my cupcake scoop. The reason is that we have tried hundreds and hundreds of cupcake recipes and my scoop is just a daily reminder of how far we have come! Each time we try out a new recipe, the same excitement is there for me: How will it turn out? How can I make it better? How will everyone like it? 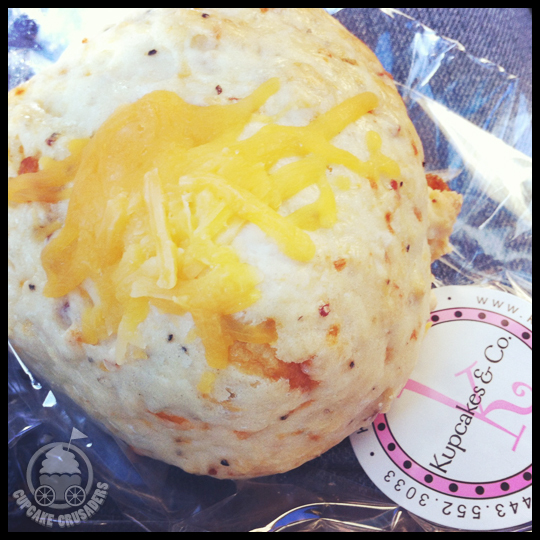 You recently began expanding the line of baked goods you offer at Kupcakes & Co. Besides cupcakes, what is your next best seller? Our gourmet cookies are huge sellers at Kupcakes & Co. My daughter, Amanda, who attends the CIA (Culinary Institute of America) shared with us one of their secret CIA recipes for Sweet & Salty cookies and we can’t bake then fast enough. Also, our Chewy Chocolate Chip cookies are great sellers as well – that recipe was given to me from my very best friend, who lives in Maine. It has been in her family for years! Biscotti, coffee cake and scones are also yummy treats we sell. I also have to mention that we are selling so many cakes now. 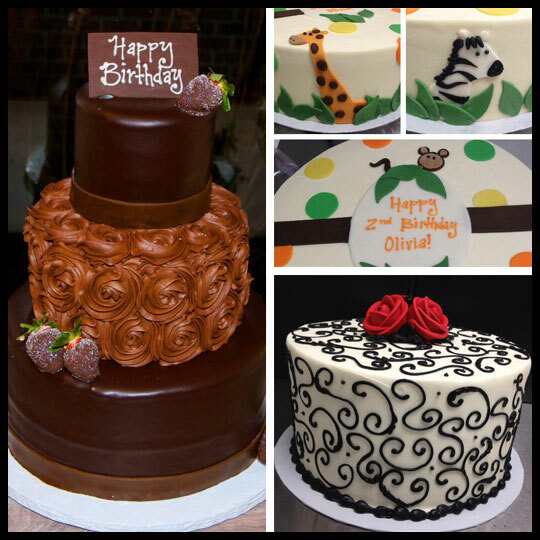 We have such talented bakers/pastry chefs at Kupcakes & Co. and we are getting more and more calls everyday for cakes. We average about 8 cakes a weekend – some very simple and some very elaborate! Do you have any other goodies you are working on that you can give us a sneak peek of? 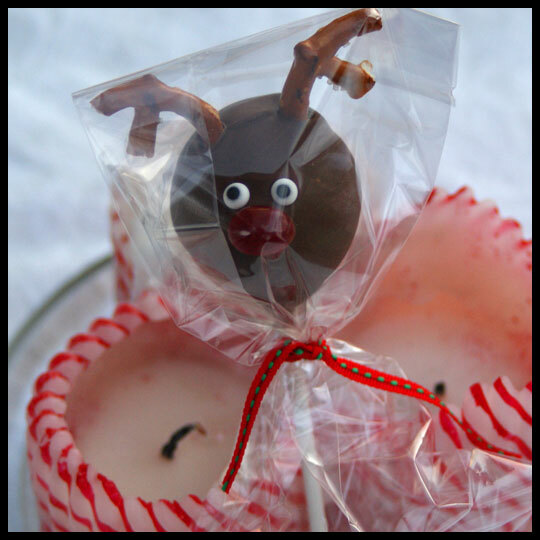 We are coming up with seasonal goodies all of the time. We just introduced our spring Lemon Wedding cookies and our cupcake clients seem to love them. Also, for Easter we made sugar cookie sandwiches, shaped liked bunnies and filled with ganache. We just had a client ask us to make cannoli for her wedding this summer, and we said, “No problem!” We are really expanding our sweet indulgences and are proud of the feedback we get from our customers. With so many wonderful flavors already, how did you come up with the idea to offer an additional boutique line of cupcakes? 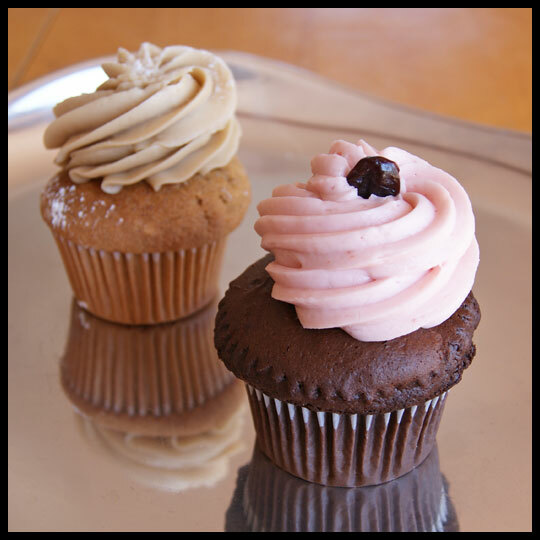 We have almost 70 signature cupcake flavors that we are very proud of. Our customers have been asking for filled cupcakes for a while now. We really worked very hard on this concept and decided that a Boutique line of filled cupcakes would be a perfect complement to our signature line. Since we use only the finest ingredients, we knew they had to have the WOW factor and we could not be more thrilled by the comments and feedback we get from our customers! We try and surprise our clients right before our newest 3 flavors come out and have them guessing the flavors. 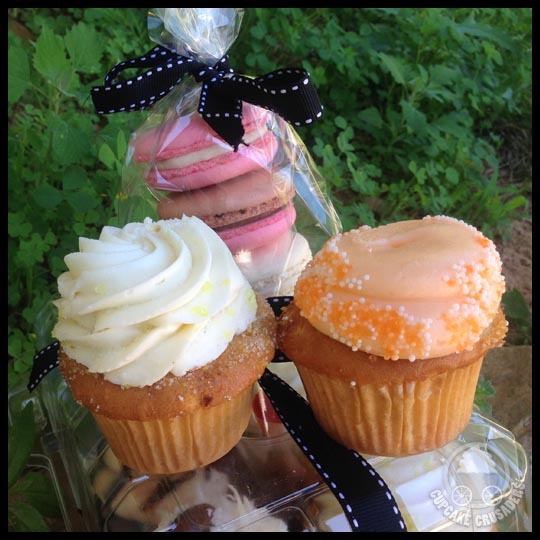 Our newest 3 Boutique cupcakes debuted last Friday and Saturday, right before Easter and the theme is PIES! Oh yes, they are going to knock everyone’s socks off! We are super thrilled about this. 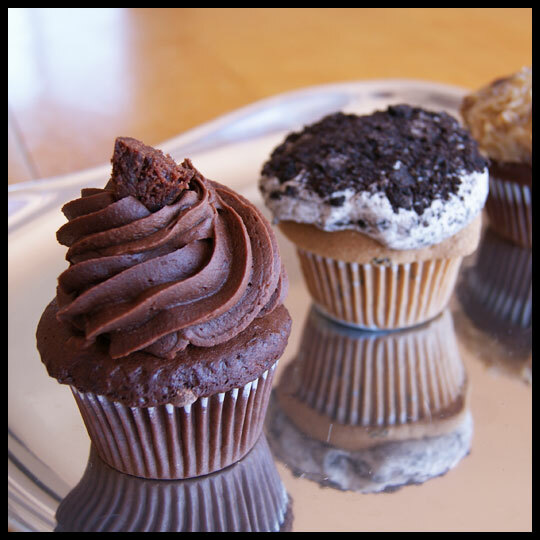 We have to ask…what is YOUR favorite cupcake flavor? 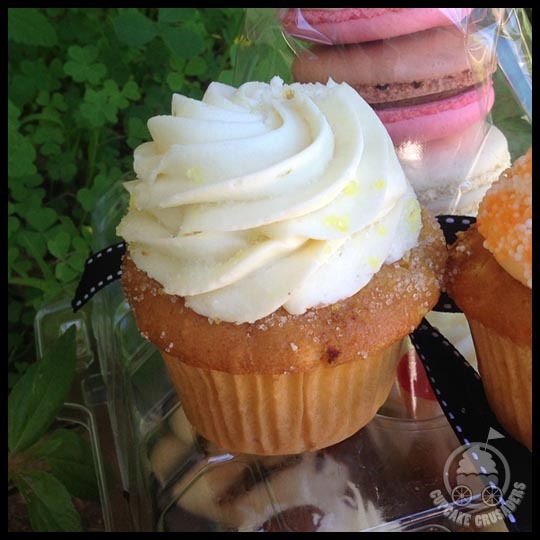 Well, I have a few for sure… but my most favorite vanilla based cupcake is our Keylime. I love the tangy and fresh key lime buttercream and I have such fond memories creating it with my dear Amanda! My most favorite, chocolate based cupcake is Salted Caramel. The sweet & salty taste complement one another so well and I love the richness of the chocolate cake! My most favorite Boutique flavor is definitely, Brownie Batter – one taste and you will know why! 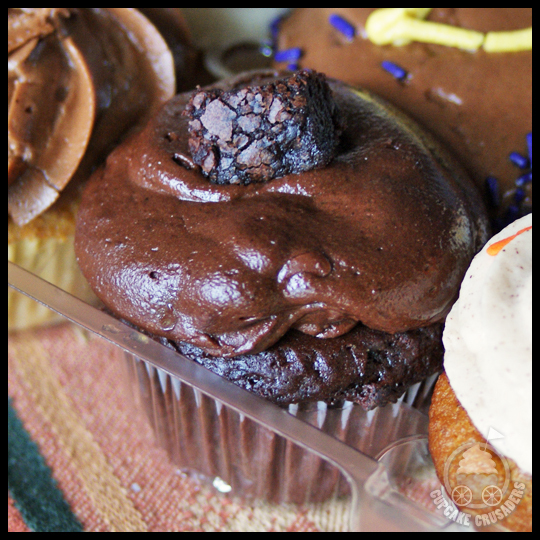 The gooey brownie center and brownie buttercream is pure bliss! 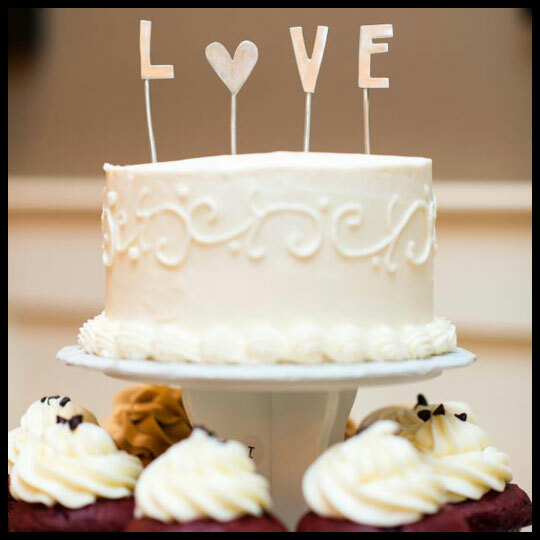 Lastly, you’ve had a lot of neat things happening at Kupcakes & Co. Can you share with us some of your favorite or most exciting orders? Some of our favorite orders include all of the baby reveal cupcakes and cakes we do! The parents to be come in so super excited to give us a sealed envelope with their sonogram in it and we wait until they leave, then open it and scream…BOY or GIRL! We then stuff their cupcakes with either blue or pink buttercream and we are also so thrilled to be a smart part in all of this excitement. We have had two very thrilling deliveries in the past two weeks. One was to NYC for a Premiere Party for Andrew Jenks, an amazing young filmmaker who produces and is on his show, “World of Jenks.” He showcases the lives of teens struggling with something and gets real with them on each episode he does. He also just wrote a book on his amazing life and it was his birthday as well. He ordered our cupcakes to help celebrate at his party and we were thrilled to be part of it all! We made custom cupcakes for him in his favorite colors (ORANGE AND BLUE FOR THE NEW YORK KNICKS!) with his favorite NYC sayings! We got to meet with Arianna and she was very interested in “our story” and how much paying it forward we do. She texted me later to say that Gayle LOVED all of the cupcakes (we brought her 4 dozen to share with her staff) and her favorite was the Pancakes & Bacon! She also mentioned that she would definitely like to keep us in mind for stories that may fit into one of O’s magazine articles one day on Women in Business! We want to thank Michelle for taking the time to answer our questions. We always love seeing a business who genuinely cares about the community and their customers grow and succeed. If you stop in, please tell them the Crusaders say hi!